Whether you are performance testing a web application or web service, you don’t want bad input data included in your test. This may skew your HTTP response times or simply add to the list of Errors that are captured during your performance test. Ideally, we want to have all clean and working input data so that any errors reported are not because of the data the test is using for a HTTP request. But sometimes we have data that has not yet been tested. So how do we clean up this data so that our test only uses input data that has been confirmed to work? One way to solve this problem is to use Visual Studio web tests to filter out any data issues from your data set using the following techniques. 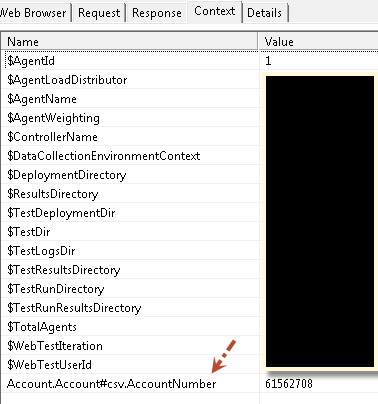 Here is a simple web service test that sends a request to verify if an account exists. I add this plug-in to my web test to illustrate how it works. The data source this test uses is a CSV file with only one field, AccountNumber. Here, I have intentionally added two bad accounts. It is important to note that the properties on your data source should “Select all columns.” Just highlight the data source file and view its properties. Doing this, will allow all the fields from your data source file to be added to the webtest.Context collection. Though in this scenario we only have one field, it will work with multiple fields. Here is the data source field in the Context collection. 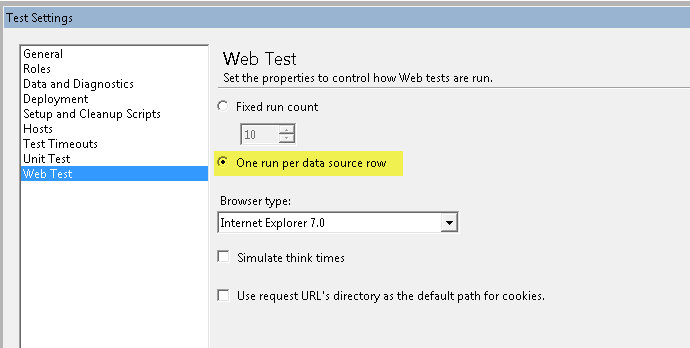 In Visual Studio’s Solution Explorer, choose a Load and Web Test setting. It should be under the Solution Items folder and has an extension of *.testsettings. Double click on your test setting file to Edit. Select Web Test on the left navigation, and choose the radio button to “One run per data source row.” This will allow your web test to run one iteration for each row of data in your data source file. Now run your test. Notice iterations 2 and 4 failed because we added bad data. If you look in the text file that gets created at C:\DataValidation_OUTPUT, only the iterations that passed will get written to the text file. Now you can simply copy and paste this over your existing data source and know your test will only use good, clean data. It is a good habit to delete the DataValidation.txt file when you are done with it. Otherwise, if you decide to run the web test again with this plug in, data will append to the existing file. Don’t forget to remove this plug-in in your web test once you are complete. If you like to use XML data instead of CSV, here is a great site to convert CSV into XML. 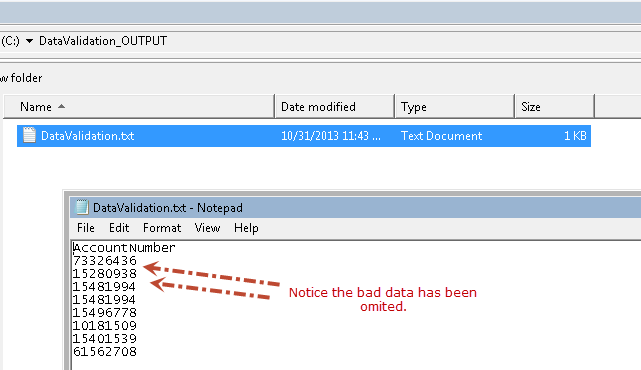 There are known issues with Visual Studio when using leading 0s or dates in your CSV data file. Visual Studio may intentionally remove the leading 0s or format your date in an unexpected format. But these issues don’t seem to occur when using XML. Here are the 5 properties that are exposed. The DataSourceName is the name of your data source. This will help if you have multiple data source files within your web test and need to validate one of them. The plug-in currently does not support multiple data sources. But you can easily do that but adding in looping logic in the code. DriveLetter, File Name and Folder Name is where you can specify the location of the output file. Plugin Enabled allows you to turn the plug in ON or OFF. // If the web test passed, then use this plug in to write the data to a text file. //Here we are searching for the data source index. /// This method retuns a list of strings found for the xml element you specify.